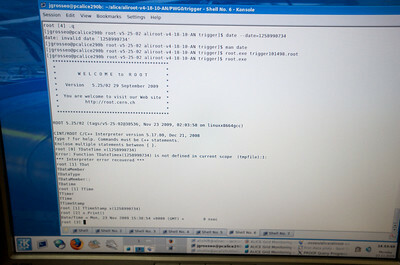 ALICE First Collision Run, 2009. 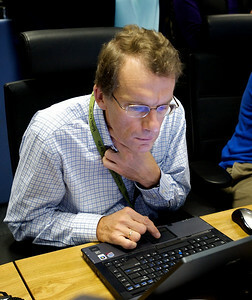 DAQ coordinator Pierre Vande Vyvre intensely following the progress of the first collision run. 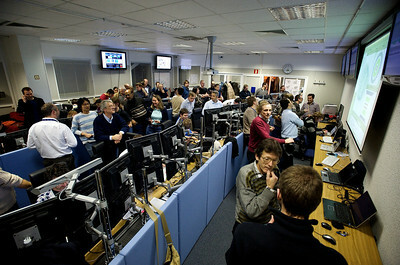 The ALICE control room during the first collision run. 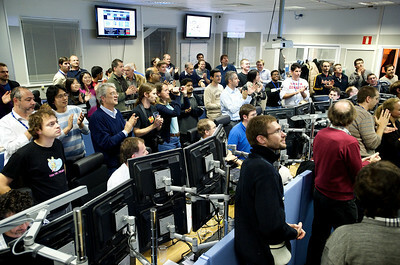 Applause in the ALICE control room at the end of the first collision run. 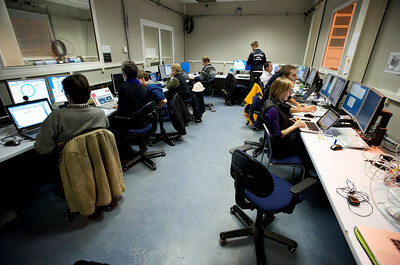 The offline team processing the first events in the ALICE control room. 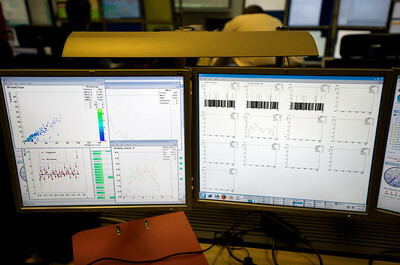 Trigger monitoring station in the ALICE control room. 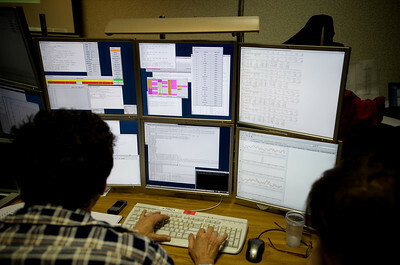 Waiting for the first reconstructed events in the ALICE control room. One of the first events in the ALICE event display. Looking at the first events in the ALICE event display. 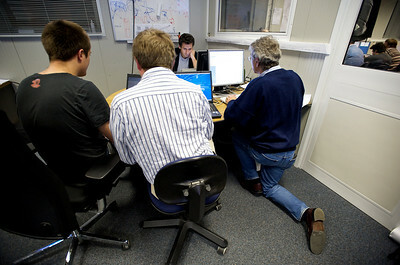 The first ALICE events being reconstructed with PROOF. 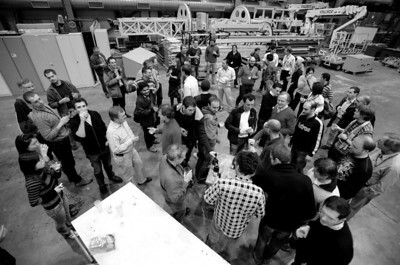 Champagne at the end of the first collision run. 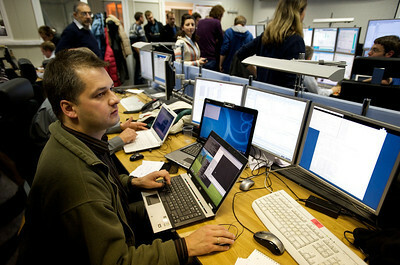 Spokesperson Jurgen Schukraft (front right) and collaborators studying the events of the first collision run in the ALICE control room. First rough analysis of the first ALICE events. 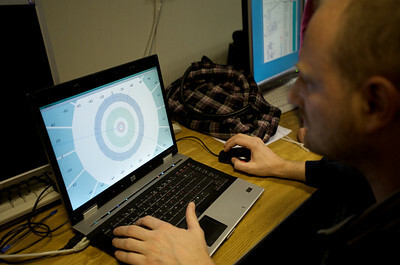 At the bottom of the screen the exact time of the first event in ALICE. 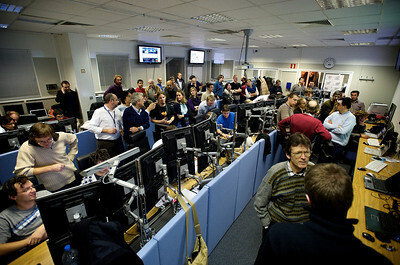 Spokesperson Jurgen Schukraft (front right) mailing CERN managenemt about the success of the first collision run in ALICE. 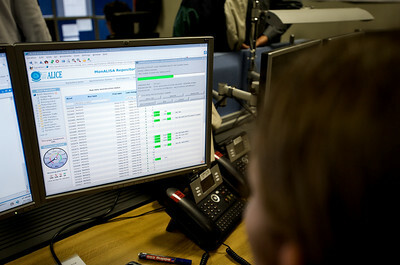 ALICE sub-detector control room, analyzing detector performances after the first collision run.